Topps followed up the success of 2012’s Star Wars Galactic Files with series 2 in 2013. The breakdown of the set was extremely similar to the first series with 350 base cards, and 5 different chase sets with a total of 57 cards.Once again premium inserts included sketch cards and autographed cards, but the manufactured patch cards were replaced with a 30-card set of starship medallions. Equal numbers of each of the 12 medallions were produced, but they were not distributed equally among the character cards. 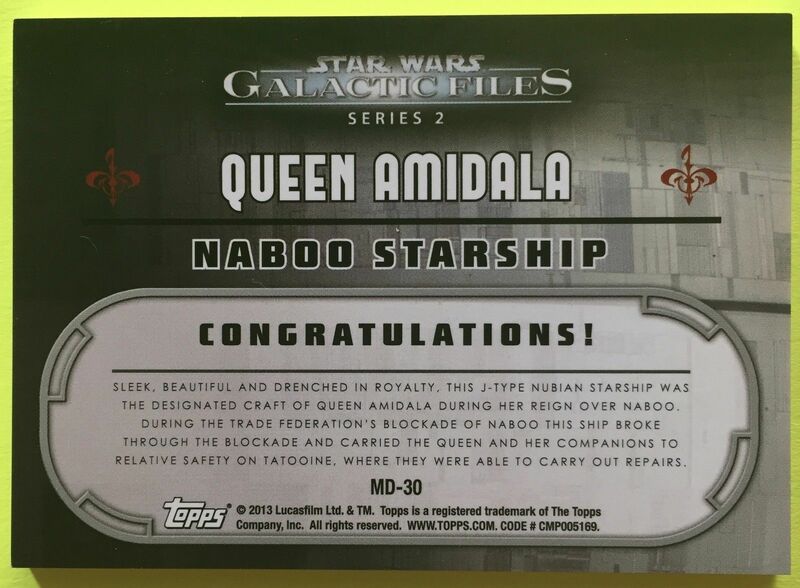 The Queen Amidala card is the rarest one. I purchased the card earlier this month from Marc Arakaki on eBay.